Heat oven to 400°F. Spray 8-inch square (2-quart) glass baking dish or 2-quart casserole with nonstick cooking spray. Cook ground beef in large skillet over medium-high heat until thoroughly cooked, stirring frequently. Drain. Stir in soup mix, chopped tomatoes, rice and water. Bring to a boil. Pour into sprayed baking dish. Cover tightly with foil. Bake at 400°F. for 20 to 25 minutes or until liquid is absorbed and rice is tender. Uncover; top with tomato slices; sprinkle with cheese. Bake, uncovered, an additional 10 minutes or until cheese is melted. One and one-half cups of canned diced tomatoes can be used in place of the fresh chopped tomatoes. Drain them well. Bring the mixture to a boil as directed in the recipe. Spoon mixture into a microwave-safe casserole. Cover and microwave on HIGH for 2 to 3 minutes, or until liquid is absorbed. Uncover and top with tomato slices and cheese; microwave on HIGH for 1 to 2 minutes, or until cheese melts. 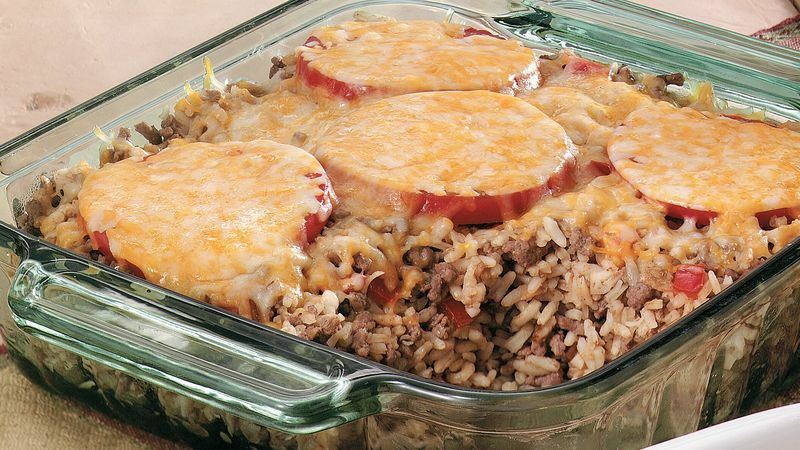 To make Cheesy Beef Stuffed Baked Tomatoes, prepare the recipe but do not top it with tomato and cheese. Spoon the baked mixture into 8 large hollowed-out tomatoes. Arrange the stuffed tomatoes in a shallow baking dish and sprinkle with shredded cheese. Bake at 400 °F. for 5 to 10 minutes, or until the tomatoes are hot and the cheese melts.